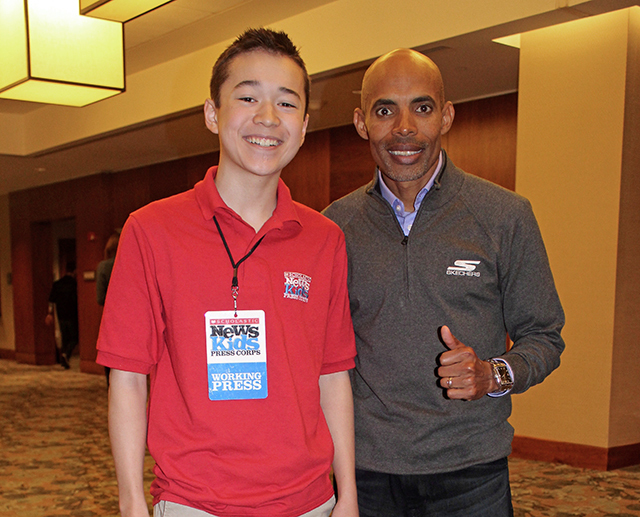 “Marathon Meb” | Kid Reporters' Notebook | Scholastic Inc.
American distance runner Meb Keflezighi thought that he had retired. But the championship marathoner had one more mission. At the age of 42, he ran the 2018 Boston Marathon to raise money for the Martin Richard Foundation* (MR8). The nonprofit organization, which was founded by Martin’s parents, honors the memory of the eight-year old boy who was killed in the terrorist attack at the 2013 Boston Marathon. For Keflezighi [KAH-flez-ghee], running has always been a way of life. “It’s what I love to do, and it’s who I am,” he said at an event in Boston, two days before the race. Keflezighi officially retired from competition after the 2016 New York City Marathon. But he honored his commitment to run one last race. The runner had first met Martin’s parents, Bill and Denise Richard, at a charity event before the 2014 Boston Marathon. “If you ever need anything, please reach out to me,” Keflezighi told them. Martin’s father took him up on the offer and asked him to run the 2018 Boston Marathon as a member of Team MR8. On the morning of April 16, Keflezighi set out from the starting line with more than 27,000 other marathoners. They raced through Boston’s hilly streets, battling heavy winds and cold, driving rain. Those were “the toughest conditions I’ve ever run in," Keflezighi told a reporter after the race. It was his 24th marathon. Keflezighi finished in 3 hours and 13 seconds. That was nearly an hour slower than his winning time at the 2014 Boston Marathon, when he finished in 2 hours, 8 minutes, and 37 seconds. But this year, Keflezighi was running for a cause. With the names of all four victims of the 2013 bombings printed on his shirt, he said that he was “honored” to represent Team MR8. * In 2015, Maxwell was among 27 students to receive a “Bridge Builder” award from the Martin Richard Foundation for creating a service project in honor of Martin.